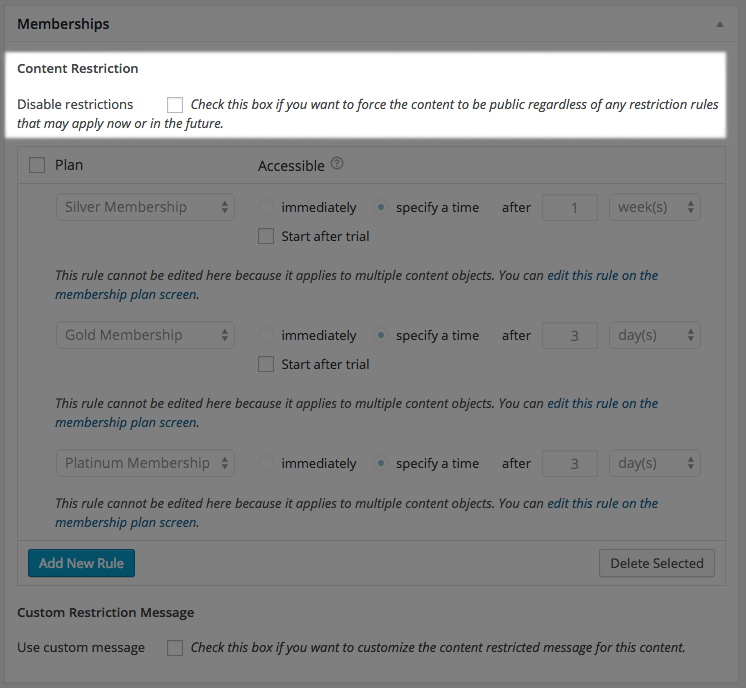 WooCommerce Memberships provides several methods for restricting content on your site. You can restrict content while creating or editing a membership plan, by adding rules from the Memberships meta box while editing content, or by using a shortcode. Note that if no rules are applied to content, that content is publicly accessible. Once a rule has been applied to content, that content is restricted, and only accessible to memberships that grant access to that content. There are situations in which restriction rules could overlap. For example, you could have a restriction set that members can access the “Coffee” category of posts, but only after 1 week has passed. All posts in this category will now abide by this rule. However, if you also create a rule for the “Moka Latte” post in the “Coffee” category, you could say that this post is restricted, but accessible immediately. This introduces a conflict, as both of these rules apply to the same content. When this occurs, Memberships always defers to the more specific rule. In this case, the post will be accessible immediately, because a rule for the post is more specific than a rule for the entire category. Rules that restrict an entire content type, such as all blog posts, are put into effect first. They can be overridden by more specific rules. You can restrict all blog posts, but then set rules for categories or single posts. A rule for blog post categories or tags (taxonomies) will override a rule for all posts, as it is more specific. A rule for a single blog post or group of posts will override both rules for an entire content type and for a taxonomy, as this rule is most specific. If two rules are of equal specificity, the rule that grants access first will be followed *. *Example: If a post is in both the “Marvel Superheroes” and “Avengers” categories, rules could be applied to both of these categories that conflict. If “Marvel Superheroes” is accessible after two weeks, and “Avengers” is accessible after one week, the post will be accessible in one week. The earlier access rule will always be used. This can help you expedite setup, as you may want to delay access to a category, but provide access to one or two posts immediately. Restricting content while creating or editing a membership plan provides the most control over content restriction. While editing a plan, you can restrict all pages, posts, categories, or other types of content easily. 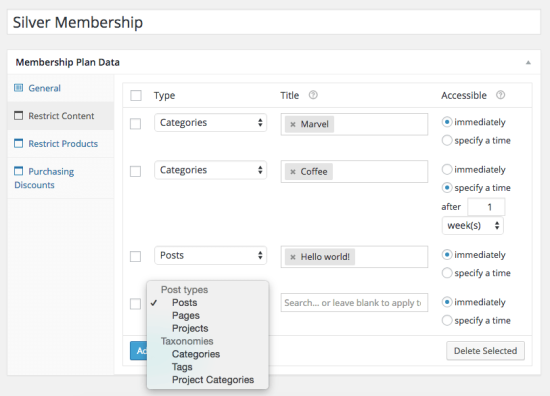 You can also create specific restriction rules for individual posts, pages, or taxonomies (such as categories), and determine when members should get access to this content (immediately or after a certain time has passed). You can learn more about creating plans in the Membership Plans document. Product restriction is unique because either viewing or purchasing restrictions can be used. Products can be restricted from the plan page as described above, but they can also be restricted while editing the product. Because products can both grant access to memberships, as well as be restricted by memberships, the product meta box is slightly different from the default Memberships meta box. To restrict a product while editing it, view the “Memberships” box, and go to “Restrict Content”. You can create a rule here that will restrict this product to the selected plan, just as if it were added from the plan page. Note that if you already have restrictions in place that affect more products (i.e., a category-level restriction that affects this product), you cannot edit it from here and must edit it from the plan page. 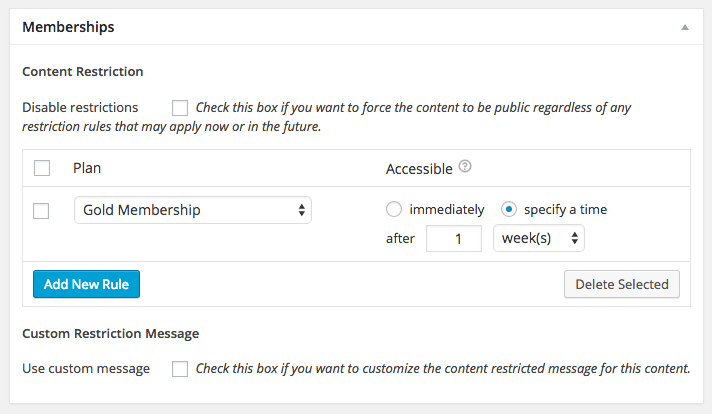 The Memberships restriction meta box will be added to your pages, posts, and other content while Memberships is active. 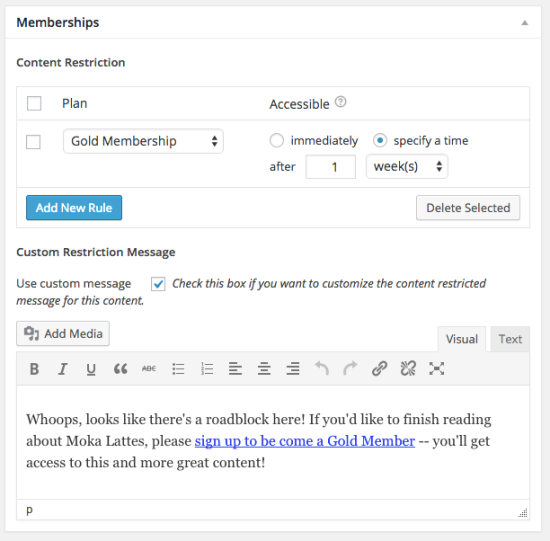 This will allow you to add membership restriction rules on the fly as you edit or create content. To restrict a page or post while it’s being edited, simply add a rule to restrict the content to a particular membership plan. You can also use custom restriction messages if you’d like to tailor the restriction notice to this content. If enabled, this will override the default / global restriction message set under WooCommerce > Settings > Memberships > Messages. If you’ve restricted content, you can still make it public (version 1.1+). While viewing your post, page, product etc., you can disable restrictions. This overrides any and all rules that apply to the content, making it publicly accessible for everyone. This can be done from the “Memberships” meta box while creating or editing the content. This is an easy way to make teaser content public. For example, you could restrict all posts with a single rule, and then use the “Disable restrictions” option to make some public as a teaser for your membership. If you have public content with restrictions disabled on your site, this will be listed on the membership plan page for reference. The [wcm_restrict] shortcode provides an easy way to restrict blocks of content within a page or post. This is most useful when you don’t want to restrict and entire page or post, but portions of the content should only be visible to members, such as tutorial videos or infographics. This will not show a restriction message, so you can use the non-member shortcode if you’d like to add a restriction message. This content is now public again. You must use the appropriate slugs for your membership plans, which can be viewed from the plans list or by editing the plan. 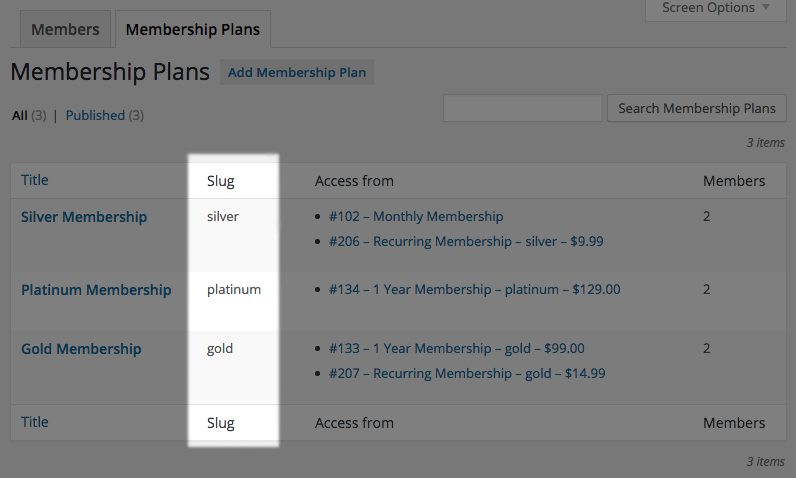 You can use the plan ID instead of the slug if preferred (which is the same as the WordPress post ID). This content is only visible to gold or platinum members. Members with other plans or non-members cannot see this. Delaying access for a length of time can accept any time for the delay argument, such as: "3 days", "2 weeks", "1 month", or "2 years"
This content will be available to members of any plan once they've been a member for two weeks. Delaying until a date can accept several date formats, but we recommend using the ISO standard (yyyy-mm-dd). For example, you can use: "January 1, 2016" or "2016-01-01"
This content will be available to members of any plan on January 1, 2016. NOTE: If you use a time, such as "May 1" with no year, be aware that this access may reset each year. For example, this content will be available May 1, 2015 to December 31, 2015, then access will reset and the content is inaccessible again from January 1, 2016 to May 1, 2016. Please ensure that you include a year to be specific about the access date. You can also delay access based on trial status. This content will be available to all members except those in a free trial from a subscription. They will have access when the free trial ends and the membership moves from "Free Trial" to "Active" status. This content is available to any silver or gold member one week after the trial period ends. If the membership doesn't have a trial period, access is simply delayed 1 week. Since shortcodes do not display restriction notices, you may want to give your non-members a notice to log in or purchase a membership. You can do so with the [wcm_nonmember] shortcode, which displays portions of content only to non-members. Non-members are guest users or customers who are logged in, but do not have a membership. This is content everyone sees! Whoops, this video is for members only. If you have a membership, please log in. If not, you can definitely get access! <a href="/membership/">Purchase a membership here</a>. Embedded video displayed to members only. Now we're talking to everyone again. (Version 1.9+) The non-member shortcode can specific plans if you want to alter its behavior slightly. If you add a “plans” attribute, this will no longer only target non-members; rather, it will target all visitors who are not active members of the specified plan(s). This is shown to anyone who does not have a silver OR gold membership active. When paired with [wcm_restrict] to target certain plans, you can dynamically display content appropriate to the member’s level. Remember, if a member has multiple memberships, they may see multiple messages. Hey there! You've stumbled onto a members-only video :). If you'd like to check out this video, please purchase a Platinum Membership. Hey Member! Thanks for checking this page out -- however, it's restricted to Platinum-level members only. If you'd like to access it, please purchase to a Platinum Membership. The super secret video for platinum members goes here.